How can a man be brave when he's afraid? 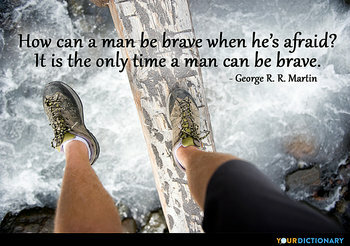 It is the only time a man can be brave.  George R. R. Martin, A Game of Thrones, Chapter I (Bran). It is brave to be involved To be not fearful to be unresolved. 'Tis more brave To live, than to die.  Owen Meredith (Lord Lytton), Lucile (1860), Part II, Canto VI, Stanza 11.  1936 Ashley Wilkes. Gone with the Wind, ch.31.  Iphigenia in Tauris (c. 412 BC) l. 114.